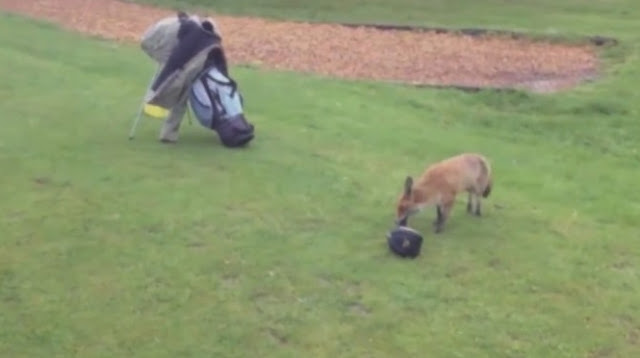 A playful fox was observing a game of golf, and decided he definitely wanted in on the action somehow. When one golfer wasn't looking, the mischievous fox snuck up, surveyed the situation ... ... and then stole the guy's golf bag. The fox dropped the golf bag pretty soon after stealing it, and the golfer took it back, assuming that was that ... until the sneaky fox decided to try again. Of course. The golfers didn't think they'd get off that easy, did they? He ran back, stole it again ... and then, it became a game. It seems a little more exciting than golf, anyway. Responses to "Fox Plays The Most Puppylike Game With Shocked Golfers "